We found a great bargain on sweet potatoes and stocked up on them. When we got home, we started looking online for some options on how to prepare them. Tonight, we settled on roasting them with rosemary and garlic. It’s very similar to our recipe for roasted beets. We just kind of winged it by combining a few recipes that we found. One thing we added was chopped walnuts and red pepper flakes. 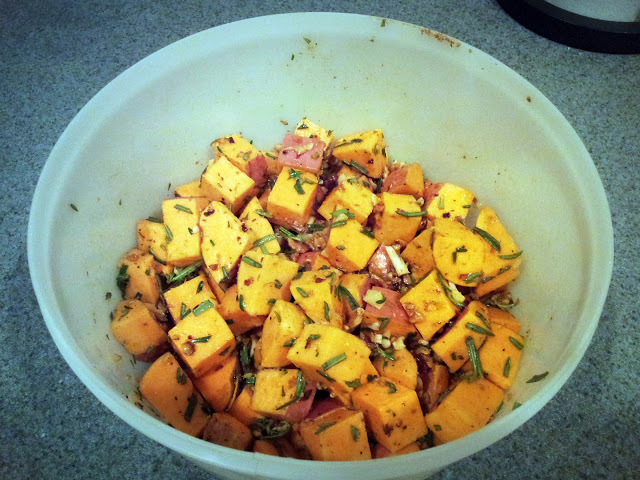 Some of the recipes had these so I thought it sounded like a great addition to give it a nice fall, earthy flavor. These are optional and I am sure it would taste fine without them. however, the roasted walnuts really are a nice addition to this recipe. Wash your potatoes thoroughly. We like to leave the skins on them so we use a scrubber on them to remove all the dirt and debris on the outside of them. However, you can peel them it you don’t like the skins. 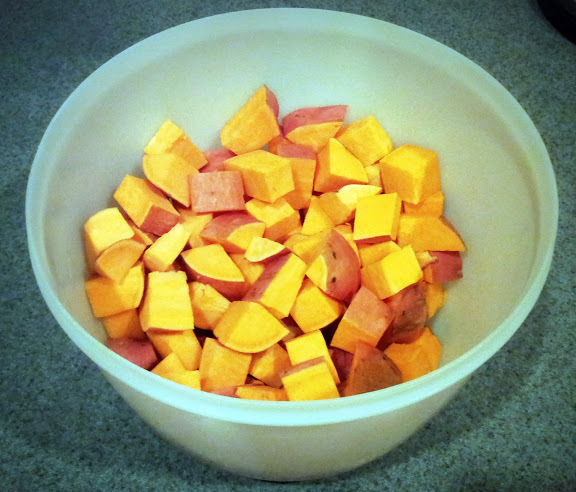 Cut your sweet potatoes into 1 inch cubes and place them in a large bowl. Add your chopped rosemary, garlic, sea salt, nuts and pepper flakes. Now add that olive oil and mix to get an even coating of olive oil on all the potato cubes. Place the potatoes in one layer on a greased baking sheet. Bake at 425 until they are golden, about 30 minutes.